I attended the Canadian International Auto Show in Toronto this past week and was able to take some pictures of the Chrysler Pacifica as well as listen to a presentation. here are some of the pictures that I took and I also have written here some of the things that were said in the presentation, as well as my own thoughts. Let me know if you have any questions and I will try to answer them if I can. FCA seems to be quite proud of being the first company to build a minivan, and also one of the last to continue to build minivans, and they have pretty good reason to be proud since the new Pacifica is a really nice looking example of a minivan. The two things I will mainly talk about are the styling and the hybrid variant. 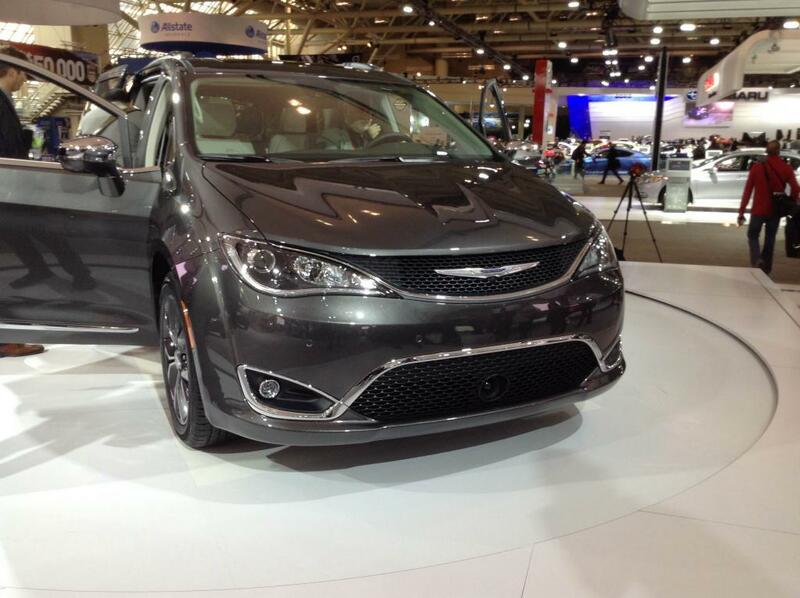 The Pacifica is a brand new nameplate, which comes with a brand new architecture and styling. A snow drift was used as the inspiration for the sheet metal, and Chrysler wanted to make sure the Pacifica remained sporty. I think they did a pretty good job within the limits of what a minivan must be shaped like. The little spoiler on the rear contributes nicely to this sporty feel. The Pacifica hybrid is the very first hybrid minivan. The hybrid version has a range of about 850 km (battery + gas) or 48 km when running on battery only. The hybrid version looks different from the gas powered version with a unique interior, grille, and teal color option. 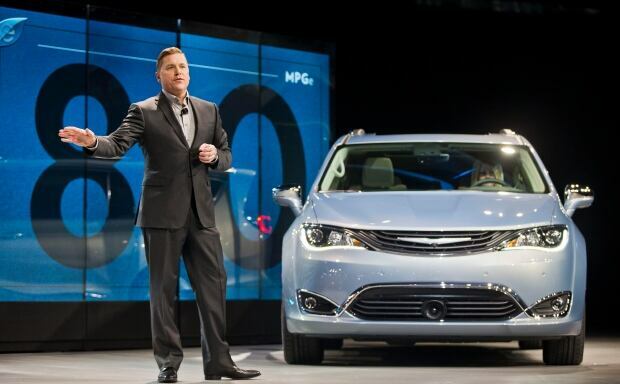 Chrysler plans to put out a full EV version of the Pacifica in the future. Some last notes on cool features... There are screens attached to the back of the front seats for rear seat passengers. An app that is available for the screens is called "Are we there yet?" which visualizes for kids how long till you reach your destination, similar to the map on an airplane. Now parents have one less reason to talk with their children while in the car. :P A vacuum is built right into the van and there is also a 3 pane sunroof that lets in plenty of natural light. I was pretty impressed with the van in person. The hybrid sounds great, but I'll have to do some math to see if the battery range is worth the extra cost. The gas version may be a better choice financially. And here is one last picture to show you the difference in grille between the hybrid and gas versions. hybrids are picking up good volume so there's a good chance we can see more of the demographic get hybrid over gas, we're in that period where full petrol cars are starting to go on a decline. Hybrids re great because of the increasingly strict emissions standards car manufacturers have to meet thanks to Dieselgate but that's better for us as buyers. More options out there especially now that there's a van hybrid and it has all the bells and whistles. Indeed, as one of the biggest polluting industries around. And judging from the people I know that would be into buying one of these, they're typically a bit more environmentally conscious and willing to spend more, otherwise they'd buy some entry-level Kia van and call it a day. Its not dieselgate that made standards stricter. The standards were getting stricter anyway. Perhaps testing is becoming more intense, but the standards are the same as they were pre-dieselgate. Crazy at all the standards to be met going on these days especially with car makers making world market vehicles and making a single vehicle that has to comply with standards from various nations. Ted, did they have the automatic door opener installed on the van when you were there? The one where you swipe your foot on the side and the door opens? I didn't see that happen. The doors open automatically with the handle but I did not know of anything with the foot. The automatic door opening, with the swipe of your foot, isn't available yet. When I ordered one last week, they gave me a credit for that feature not being available. Perhaps, by the time the hybrid comes out, they'll have it figured out.